Mahindra TUV300 Plus has been caught testing multiple times over the course of past one year. Now, spy pics of the car arriving at the dealerships are being shared over the web. This highlights that the car will be launching soon. Not just this, the spec-sheet of one of the variants has also been leaked. The pics and spec-sheet have been shared on TeamBHP. The new 9 seater car is based on Mahindra’s TUV300 sub 4 meter SUV. The TUV300 Plus carry the same design as of TUV300 in principle, with a slightly different and stretched tail end. 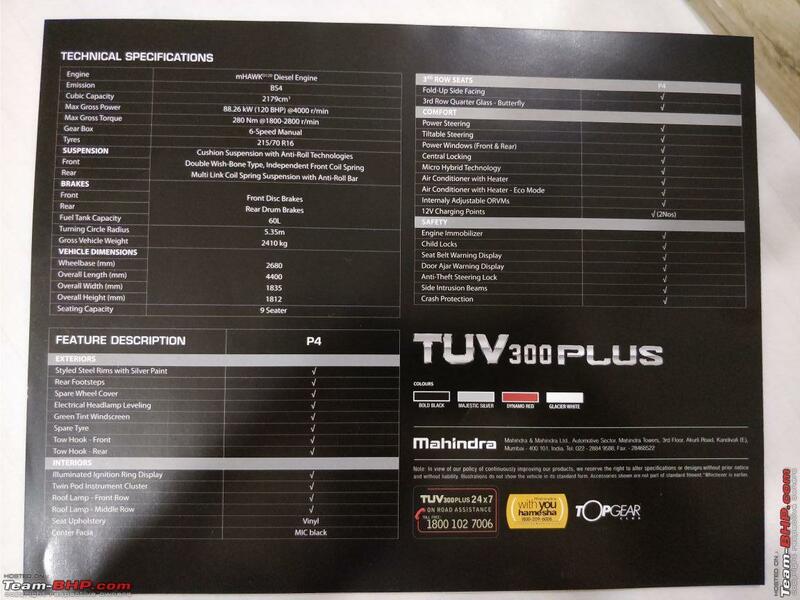 Looking at the spec-sheet, Mahindra appears to be only launching the P4 variant of the car to start with. This might be the base variant and higher variant will follow at a later stage. The car will be 4400mm long, 1835mm wide and will have a wheelbase of 2680mm. The P4 variant will come with fold up side facing seats in the third row, which should be good for seating 4 passengers, giving overall 9 seats to the car. TUV300 Plus will get a completely different motor than that of TUV300. It will be powered by a 2.2L mHawk diesel engine good for producing 120BHP and 280Nm torque. It will come mated to a 6-speed manual transmission. The car will also feature Mahindra’s Micro Hybrid technology. The P4 variant will feature 215/70 R16 tyres on steel rims with silver paint. Braking duties will be done by disc brakes at the front and drum at the rear. Mahindra TUV300 Plus P4 will be offered in four shades namely Bold Black, Majestic Silver, Dynamo Red and Glacier White. 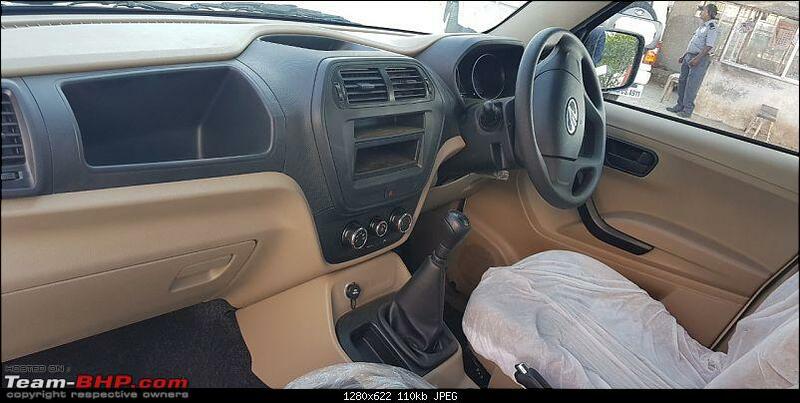 The car is expected to be priced in a range varying between Rs. 9 Lakh and Rs. 12 Lakh but, there is no confirmation as yet. With the new TUV300 Plus, Mahindra will now have a full-length SUV cheaper than Scorpio in its portfolio. In addition to the private buyers, the car has a potential of being a choice for the fleet operators as well.